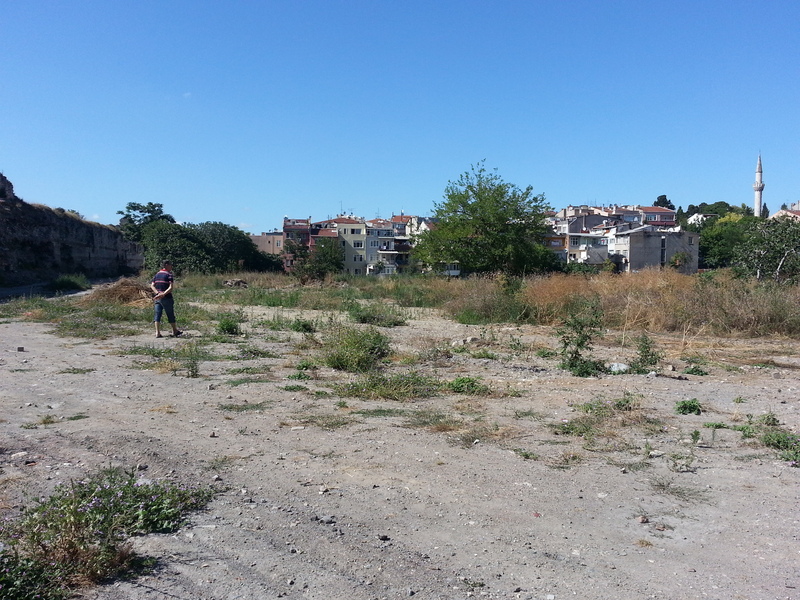 Last week, we visited an area of the city where urban farming had seen better days. The gardens of Istanbul have been an integral part of the city for centuries, facing their greatest challenges and undergoing their most profound transformations in recent years. Although the size, location, demographics and even crops being produced have changed over time for these gardens, the role of the state has had the greatest impact. Today, the overhauling of gardens in the city, owned and maintained by generations of families, has been the move by municipal authorities who feel there can be more beneficial options of the land. These projects, however, for stability and political reasons have not begun to reach completion and the “gardens” in some areas like Yedikule have been left in desolation. Although there were plenty of bostans still growing and producing at rates comparable to the past, there was an immediate feeling that things in essence were not the same when I stood and looked out at the emptiness that once was a productive city garden. In the picture above, you can see the state of one of these gardens today. Just a few years ago, this entire area was full of green and the families that rented the land from the municipality were free to make their living the best way they, and their neighbors, knew how. In his article, Paul Kaldjian explains the gradual sprawl of the city gardens over time, further out from the center of the metropolis (Kaldjian, 287). When compared to the photographs of this land almost 80 years ago by Nicholas V. Artamonoff, (pictured below), you can see that along with the green agricultural production, there was also a sense of a settled and tight-knit community in the area. Houses were aligned near the gardens on which several families would work side by side. There was a sense of community present from the agricultural neighborhoods that existed along the city walls. In contrast today, there is little settlement in this area and the homes that do exist are, on the surface, in poor condition, and the community is not bond together by the green carpet that once existed. Over a hundred years ago, this area was captured in another photo by a man with the name Sebah (pictured below). Here, there is less of a sense of neighborhood and settlement around separate land plots and instead, greater stretches of land, all designated for production of crops. You can see from the photo that the agriculture is not nearly as interrupted by houses and roads as it is in the Artamonoff photographs. This was likely during a time before urbanization further inwards began pushing out to the walls and beyond and absorbing the plotted fields of crops for settlement. In the last century, urbanization revolutionized nearly every modern city into the size and power they are today. In the last few years, for the first time ever, the world’s population was settled more in cities than in urban settings (Kafadar, class 7/3/2014). The growth in population density, coupled with the increase in importation of cheaper, mass-produced agriculture into the city, has lowered the necessity for the urban gardens. Therefore, the city has further undermined the role of the gardens over time by making them smaller and smaller to accommodate the increasing levels of settlement. This can been seen when one compares the photos over time and notice the settlement patterns around the gardens that have changed in their degree of importance and role in the city. If farmed regularly, one bostan can host 15 to 20 different crops and be able to feed hundreds of people (Kaldjian, 293). This yield, along with the amount of bostans that exist (or would exist without recent destruction by the state) helps to debunk the many myths about these gardens that they are “marginal, inefficient, and unhygienic” (Kaldjian, 287). When looking out at these empty lands associated with the “gardens” today, these descriptive factors are not hard to believe. It is ironic that the very reason for destroying these gardens, because they aren’t productive enough, is causing the problem to only become worse. Standing on the ancient walls of the city, it is impossible to not think about what the land below once looked like and functioned as. Although we have the convenience of seeing the land several centuries back from photographs and artistic representations, the origins and beginning histories of these lands are still being deciphered. 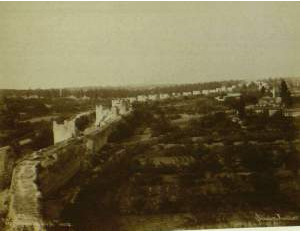 In his article, “Garden and Parks in Constantinople,” Henry McGuire did his best to make an accurate depiction of the gardens by thoroughly researching four ancient gardens by comparing a variety of interpretations of the land throughout the centuries. Aretai, he concluded, was full of wildlife across a wide ground full of pastures and wooded areas, described as “delightful” by visitors (McGuire, 255). Another garden, the Philopation, was an imperial garden, which was full of places to relax and maintained by the ruling body at the time (McGuire, 252). In both cases, the gardens served a role of providing serenity and relaxation. McGuire goes on to confirm in his analysis of the 4th century perspectives on these gardens as being more appreciative of the areas primarily as a separate sphere of tranquility than a space of production (McGuire, 262). The idea that this physical space can cause a pysiological reaction is significant. The grounds were not just designed for production and economy, they were meant to create a feeling and be a place seperated from everyday life. In her article, “The Suburban Landscape of Sixteenth-Century Istanbul as a Mirror of Classical Ottoman Garden Culture,” Gulru Necipolgu explained that these gardens were a place to host friends and enjoy conversation with one another (Necipolgu, 33). Here we see a larger role the gardens played in society. From the photographs and the location of houses to one another and the gardens shows in the last 100 years a waning and waxing of a sense of community around the agriculture. Today, there is little to compare and I think it’s safe to assume the sense of community bound by the gardens is barren. Interesting to note, also, is the change in the role of the state and the gardens. Centuries ago, they were more or less patrons of these green spaces, today, they are quite the antithesis. Although these ancient cities didn’t face the modern changes that exist today, such as the growing dichotomy of rural and urban life and economy (Whittaker, 116), there is a profound loss of care and appreciation for these green spaces and what they are capable of producing for our cities today. With the unpredictable and frankly unreliable plans of the municipality, tenants of the farms today face a constant threat that their land will also be taken over. Aleksandar, our guide through the gardens, shared with us a story about a cherry tree he planted five years ago in the Yedikule bostans. A tree, necessitating several years to reach its full production potential, require more certainty in investment than an annual crop. Just last year, Alex’s tree was taken down along with the acreage we don’t see today. The uncertainty of the municipality’s plans poses an enormous challenge to the owners who have to make investments and year-long plans for their crops in the ever changing market of agriculture. It is quite a cruel process to have long-term plans pulled out from under one’s feet, and unfortunately, that has been the pattern with some urban gardens in Istanbul today.